wicker stag. Photo by Jeff J. Mitchell. The torchlight procession has ended. The music, singing, and dancing has quieted. 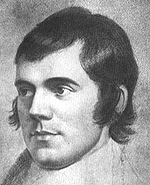 The bells chime midnight, and someone tall and dark is the first to set foot across the threshold, bringing a dram of whisky for prosperity's sake. Hogmanay is over—it's on its way to Ne'erday now. Where are you? You're in Scotland, of course, where New Year's Day—or Ne'erday—has a history that stretches back to the Reformation and Renaissance, and into the distant past. Some form of winter celebration is present in most European cultures, and Hogmanay's longstanding tradition shows its ties to other European winter solstice festivals, the roots of which go back into the distant past, heralding a return of the light after the Longest Night. In most Christian European cultures, the pagan solstice festivals were transformed into the celebration of the Christmas holiday, and the giving of gifts at New Year's eventually became a part of the Christmas celebrations. According to the Scotch Presbyterian Eloquence (1692), it was “ordinary among some plebeians in the South of Scotland to go about from door to door upon New years Eve, crying Hagmane.” The origin of the word is vague. Some say it derives from the Gaelic oge maidne, meaning “new morning.” It also appears to be related to a word in Old French, anguillanneuf, or “New Year's gift.” Children would cry “anguillanneuf!” when demanding their New Year's gift. This tradition took firm root in Scotland during the Reformation. 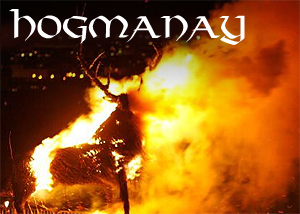 Originally just a commemoration of the New Year, Hogmanay became the only real winter festival in Scotland during the Reformation, when the celebration of any kind of Catholic mass, including Christmas, was forbidden. Despite accusations of dire papist degeneracy by John Knox and other Reformation leaders, the ancient tradition of gift-giving to celebrate the return of the sun could not be stopped, but simply attached itself to Hogmanay. It is hard to fathom, but Christmas itself was not a recognized holiday in Scotland until 1958! Gifts were exchanged at the New Year, and Christmas was just another day in the Scottish calendar. Though the nights are cold, the streets of Edinburgh fill with music and laughter for Hogmanay. On the Night Afore (Dec. 30) the city gathers for an International Arts Carnival that features street theater, roving street musicians, dancers, and a masked ball. The highlight of the night is the massive Scottish ceilidh dance, Strip the Willow, which is believed to be the longest Strip the Willow in the world. On Hogmanay night, 100,000 revelers gather in the city center to dance, sing, eat, drink, and celebrate with concerts by some of Great Britan’s leading musical artists and a few local favorites like the Red Hot Chili Pipers. A torchlit parade climaxes the festivites with the traditional burning of a Viking ship and a gigantic wicker stag, followed by a fireworks display where eight tons of fireworks are launched from Edinburgh’s seven hills. New Year’s Day, known as Ne’erday in Scotland, is also filled with energetic outdoor festivities. There are foot races, bike races, and even a huskie dog race called “Dogmanay.” Anyone mad enough can participate in the “Looney Dook,” a dip in the frigid waters of the Firth of Forth. Participants, dressed in amusing attire, jump in the river as pipers lead the spectators in encouraging songs. In rural areas, older Hogmanay traditions have survived. In Fife, a torchlight procession winds its way into the Lomond Hills as midnight approaches. 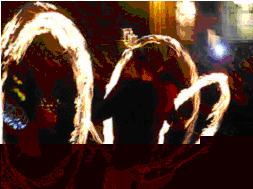 In Stonehaven, Kincardineshire, Northeastern Scotland, men carry balls of wire stuffed with flammable materials attached to chains, which they swing around their heads, like Pacific island fire-dancers swinging flaming poi. The association with the winter solstice and the return of the sun survives this way into the present day. from A. Dalgetty & Sons Bakers. 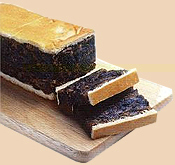 Another widespread Hogmanay tradition is called “first-footing.” Traditionally, a friend or neighbor would be the first person to set foot through the front door after midnight of the new year, bringing symbolic gifts like salt, coal, shortbread, whisky, or black bun (a heavy fruit cake traditional to Scotland). The first-footer will be blessed with luck for the rest of the year, while the householder enjoys the prosperity represented by the gifts. The origin of this particular ritual seems very ancient, as shown by the fact that first-footers are supposed to be tall and dark…hearkening back to the 12th century when the native Scots were mostly dark-haired, and a fair-haired stranger was likely to be a Viking raider—not exactly a welcome guest on Hogmanay or any other day! If you want to add this article to your list of favorites or email it to a friend, please use this permanent URL, https://stores.renstore.com/-strse-template/0801A/Page.bok. Permission is granted by the author to quote from this page or use it in handouts as long as you include a link back to Renstore.com.